As I’ve said before, I read sewing blogs quite a lot. I find them really interesting and useful for finding out techniques, patterns and ways of dealing with those little gotcha’s that the less experienced sewist doesn’t quite know how to handle. I very rarely find that the latest post someone has written is directly relevant to my current issue, but sometimes I am wondering how to tackle something, and hurrah, my brain comes up trumps and reminds me that a few months ago I read something about this and how to tackle it! I tend to read blogs on my phone on the train, and unfortunately the best way for me to remember all the blogs I like is to keep each one open in a different tab. I don’t tend to subscribe to blogs, as the notification that a new post is up means that I get on and read that post immediately – that means that when I’m on the train with nothing else to do I’ve read all the blog posts! 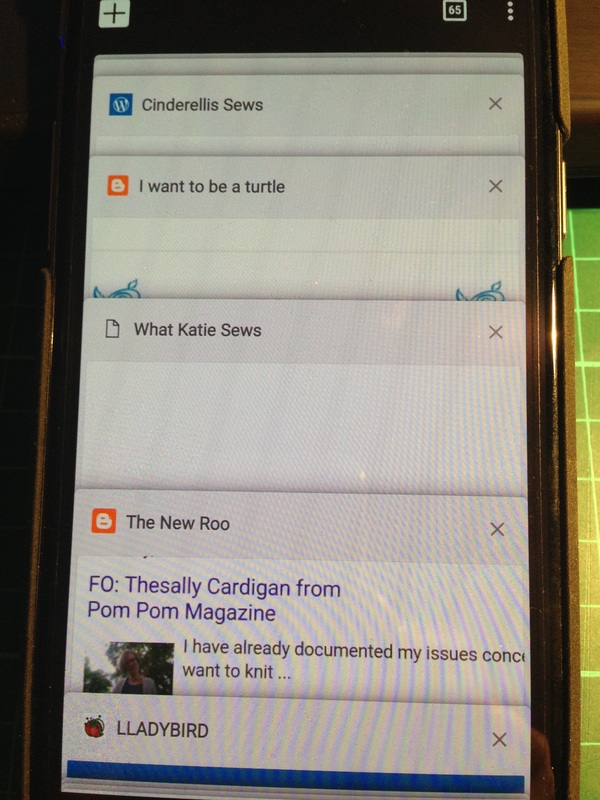 Unfortunately the browser on my (rather old) smartphone has a tendency to crash, and as such, on a fairly regular basis, I need to try and remember all the sewing blogs I like. Hmm, after I look at it like that, maybe the browser on my phone has a reasonable excuse for crashing!